This is a very exciting week for us since it is the last week of school and summer officially begins at our house! Our three months of summer here in northern New England always goes by very quickly. As our children get older, each year goes by faster than the last, and hard as I try, it seems impossible to make each moment count. 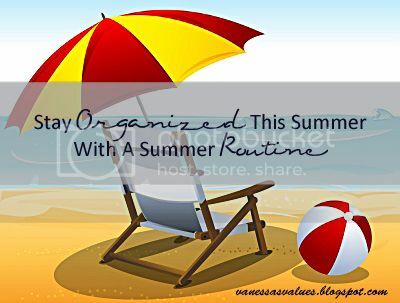 I've been thinking a lot over the past few months about what I want to accomplish this summer and I came to the conclusion that the best way to get everything done is to create a summer routine in order to help me stay organized this summer. Notice that there are a lot of gaps in our routine. I don't want every hour of every day scheduled, but I think this will be a great tool to help me to stay focused and get things done. I'm also always open to making changes to our routine as needed. What are some of your favorite summer activities? Will you be trying something new this summer? Thanks Ruth. I hope you and your family enjoy the summer.